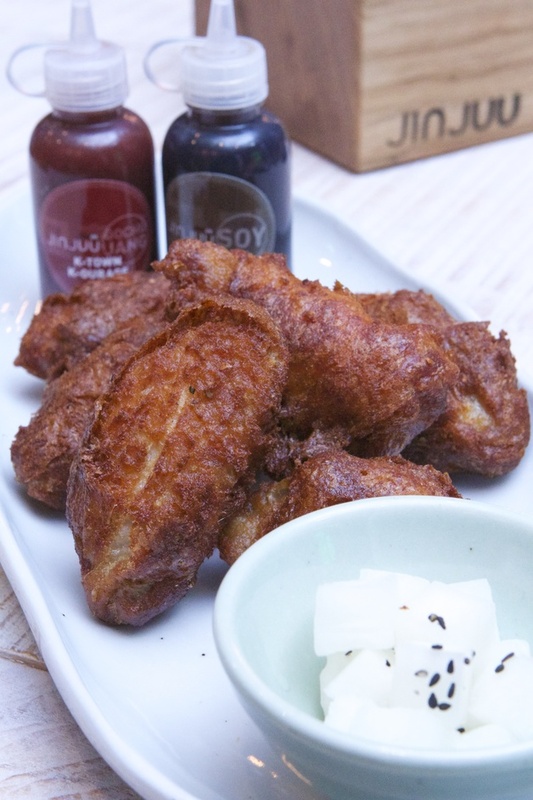 Described by the Evening Standard as one of the "best new London restaurants opening in 2015" before it even opened, Judy Joo's restaurant, Jinjuu, brings quality Korean cooking to Kingly Street in the centre of the city. A partnership between Iron Chef Judy Joo and Kia Joorabchian (founder of Babbo Group), Jinjuu provides Korean comfort foods and draws on the Korean's tradition of never drinking without food. Drinks and 'Anju' (Korean food consumed with alcohol) are served on the ground floor bar, where an illuminated back bar is decorated with beautiful bottles of the Korean spirit Soju - a key ingredient in the cocktail list. Downstairs in the restaurant proper, barbecued meats are cooked on the open grill and wrapped with lettuce, and a Ko-Mex dish of Korean carnitas fries (fries topped with braised pork and Kimchi) is on the menu. Take a seat on a comfortable banquette or at the counter if you want to watch the chefs at work. The Korean influence is also felt in the decor with a distinctive bamboo ceiling overhead, a crane bird pattern burnt into the exposed brick wall and Korean street graffiti hidden around the 85-set restaurant. Jinjuu gyms, sporting activities, health & beauty and fitness. The best pubs near London Jinjuu. Jinjuu clubs, bars, cabaret nights, casinos and interesting nightlife. Where to have your meeting, conference, exhibition, private dining or training course near Jinjuu. From cheap budget places to stay to luxury 5 star suites see our special offers for Jinjuu hotels, including The Courthouse Hotel from 93% off.